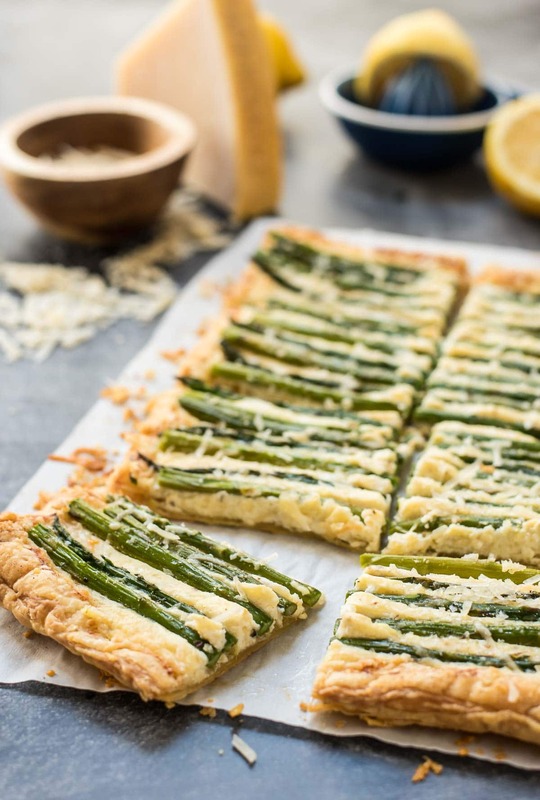 If you need a quick and elegant spring appetizer, look no further than this Parmesan Asparagus Tart with a puff pastry crust, creamy Parmesan ricotta filling, and fresh asparagus on top. There are certain foods I can’t be trusted around. Put me in a room filled with Skittles and Twinkies, and I’ll be a model of self-restraint. I can practice moderation with pizza, candy bars, even chocolate chip cookies. But if you construct a queen size blanket for me out of nothing but puff pastry and Parmesan cheese, I will eat the entire thing, even if it’s the middle of the winter and I kinda needed that blanket for warmth. It must be the way the puff pastry melts in your mouth, leaving behind a trail of tell-tale flakes on your lips. Or maybe it’s the delicate, nutty flavor of freshly grated Parmigiano Reggiano melted on top. 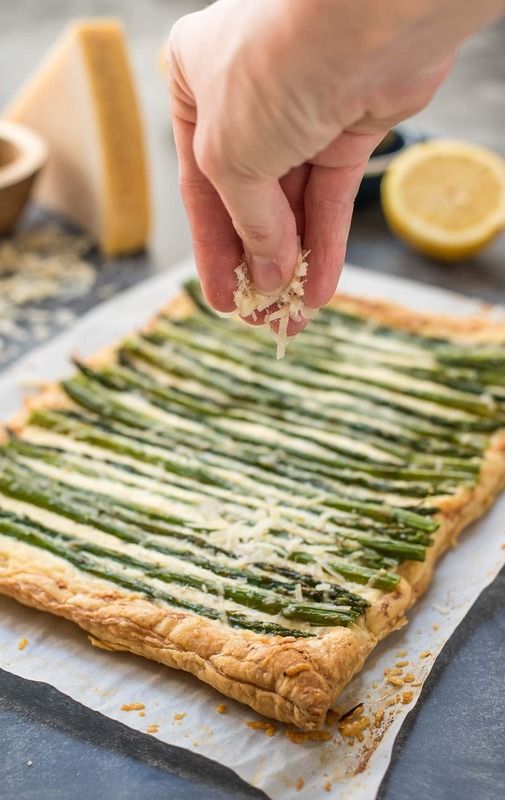 Whatever it is, I find this combination irresistible, and it’s the star of this easy Parmesan, Ricotta, and Asparagus Tart. I don’t usually call food delightful, but this tart is just delightful. 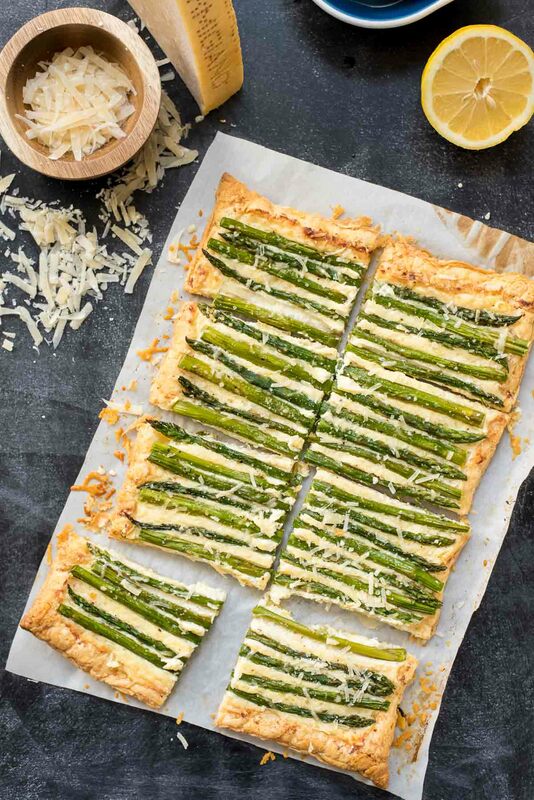 Bright with lemon zest and fresh green asparagus, this tart sings spring. It all starts with a premade puff pastry baked to fluffy, flaky perfection. 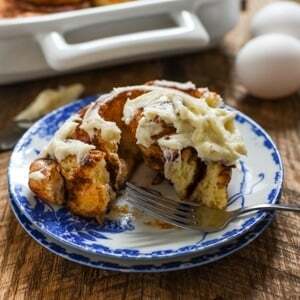 On top of that goes a creamy filling made with ricotta cheese, lemon juice, an egg, and plenty of Parmesan cheese. 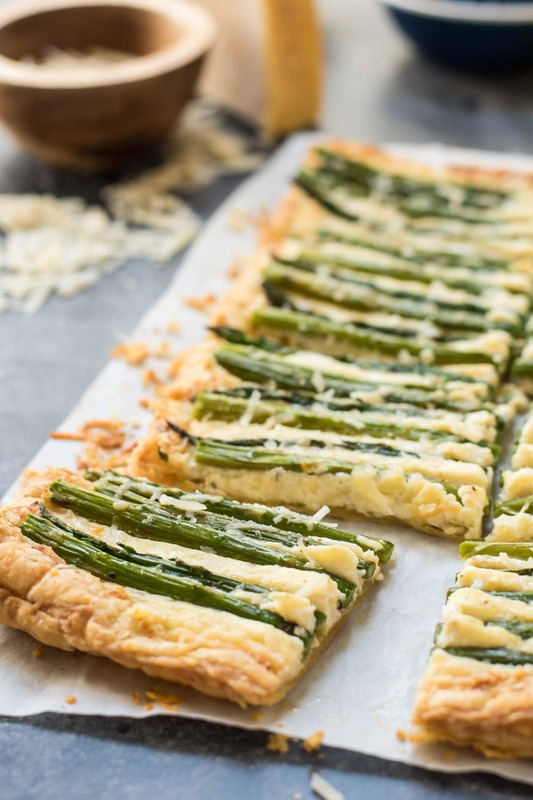 It’s topped with asparagus, baked, and then finished with a final sprinkling of cheese. Let’s talk for a minute about Parmesan. It seems to be on everything these days, right? But the truth is, a lot of the stuff masquerading as Parmesan cheese, well, isn’t really Parmesan. Real Parmesan, or Parmigiano Reggiano, is made of only three ingredients: superb milk, sea salt, and rennet. There are never any additives, fillers, or preservatives, even when it’s purchased pre-grated. 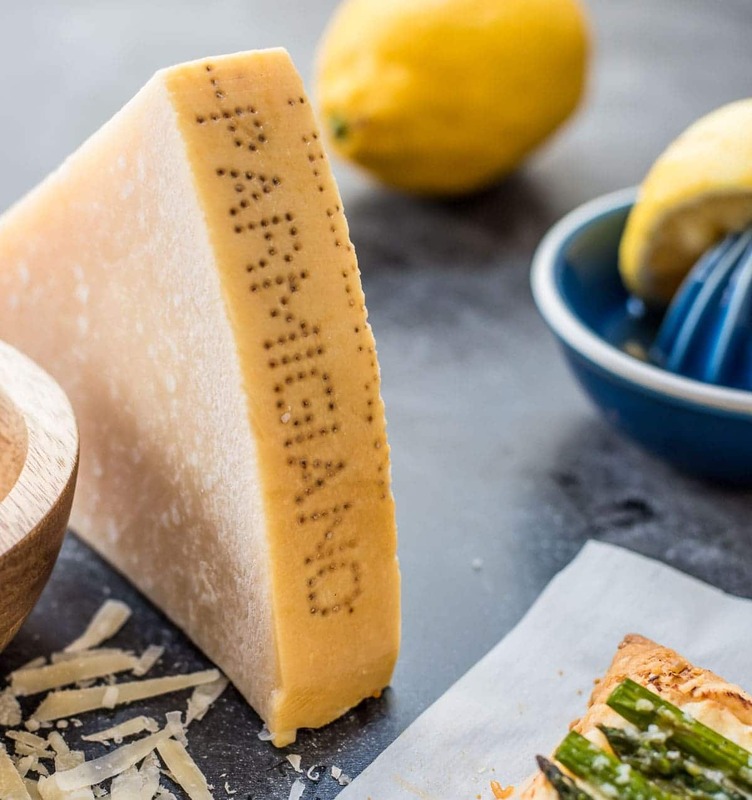 If you want the wonderful, rich flavor of aged Parmesan, look for the special rind, which has pin holes spelling out Parmigiano Reggiano. You can also ask the cheese person at your local grocery store to make sure you’re getting the good stuff! Great cheese, great pastry, and a green veggie. What more could you ask for? 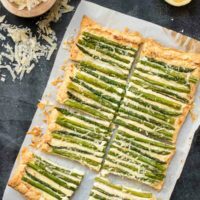 This Parmesan Asparagus Tart is perfect for Mother’s Day, a casual evening appetizer, or lunch for one girl who really loves some puff pastry and Parmesan cheese. For more information about the history of Parmigiano Reggiano and more great recipes, check them out at Parmesan.com or follow them on Facebook, Pinterest, or Twitter. Preheat the oven to 400 degrees. Carefully unroll the puff pastry onto a lightly floured piece of parchment paper and roll it out with a floured rolling pin to about a 10 inch by 16 inch rectangle. Poke the pastry all over with a fork. Transfer the parchment to a baking sheet and bake the pastry for about 12 minutes, or until lightly golden and puffed. Meanwhile, bring a large skillet of water to a boil. Add the asparagus and cook 2-4 minutes, or until they are bright green and have just a little bit of crispness left. Remove the asparagus to a plate and toss with the olive oil, 1/2 teaspoon Kosher salt, and a generous sprinkling of black pepper. Set aside. Whisk together the ricotta, 1/2 cup Parmigiano-Reggiano, egg, 1/2 teaspoon Kosher salt, lemon zest, and lemon juice. Once the puff pastry has cooled slightly, spread the ricotta mixture evenly over the top, leaving a 1 inch border all the way around. Layer the asparagus stems evenly over the ricotta. Brush the exposed crust with olive oil. 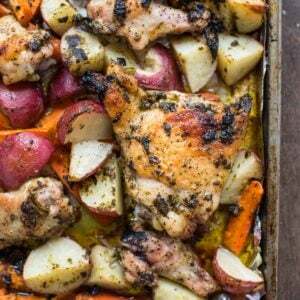 Return to the oven and bake for another 15-20 minutes, or until asparagus is tender and crust is golden brown. Sprinkle with remaining Parmigiano-Reggiano and serve. This post is sponsored by the lovely people at Parmesan.com. As always, all opinions are my own. Thank you for supporting the brands who keep this blog afloat! My son has an egg allergy. Could this be made without egg? Is there something I could use instead of egg? You know, I think you could probably just leave the egg out. The filling might be a little less fluffy but it should still bake up fine! Hope that helps!